For visiting families with teens, bike-share programs offer a fun, affordable way to explore part of city. Don't want to deal with traffic? There are plenty of bike stations near parks and other car-free areas. Here's the lowdown on some of the biggest bike-share programs in the country. Looking for a fun way to explore a city with teens? Consider two-wheeling it around town. The long-awaited Citi Bike program rolled into the Big Apple last month and proved an instant hit, with nearly 12,000 New Yorkers signed up for annual memberships at launch. Since 2010, about a dozen U.S. cities have introduced bike-share programs, and Chicago is aiming to launch its own program in less than two weeks. MORE: Bringing the kids to the Windy City this summer? Start planning here. For visiting families with teens, bike-share programs offer a fun, affordable way to explore part of city. Don't want to deal with traffic? There are plenty of bike stations near parks and other car-free areas. The programs we looked at in major cities work the same way. You buy a base subscription for 24 hours or more, during which time you get an unlimited number of 30-minute rides. If you go over your allotted half-hour ride time, you start incurring nominal fees for each subsequent 30-minute period. 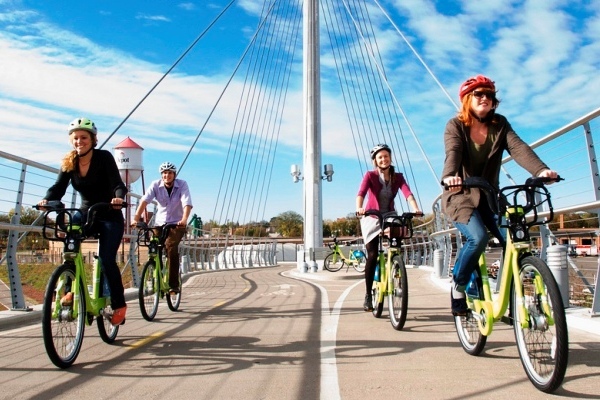 Relax and roll with it, says Anthony Ongaro, marketing director of Nice Ride Minnesota, the bike-share program of Minneapolis. "Bike shares are designed so that you never have to pay for overtime if you don't want to. To avoid incurring fees, simply dock the bike in any station and then immediately check it back out and be on your way." The bike-share programs we looked at offer excellent value for families that want to see a section of a city from the saddle of a bike. "If you'd like to take a bike out for a full hour, it would cost just $7.50 in total," says Ongaro of the bike-share program in Minneapolis. "After that, you could always take out another bike, as many times as you wanted within that 24-hour period, for a half hour at a time, at no extra cost." Recommended for visitors: Bike along the Mississippi River in beautiful Minnehaha Park. Station: Minnehaha Ave. & Minnehaha Pkwy. How much: $6 for a 24-hour pass. A one-hour rental costs $7.50. Minimum age: 16. How it works: The first 30 minutes are included in the pass; $1.50 for the second 30 minutes; $4.50 for the third 30 minutes; $6 for every half hour thereafter. MORE: Heading to the Twin Cities? Check out these kid-friendly hotels. Recommended for visitors: Glide through the National Mall and Tidal Basin area. Stations: Jefferson Dr. between 14th and 15th sts. SW near the National Monument; also Ohio Dr. & West Basin Dr. SW near the Martin Luther King, Jr. National Memorial. How much: $7 for a 24-hour pass; $15 for a 3-day pass; A one-hour rental costs $8.50. Minimum age: 16. How it works: The first 30 minutes are included in the pass; $1.50 for the second 30 minutes; $3 for the third 30 minutes; $4 for the fourth 30 minutes; $6 for every half hour thereafter. Recommended for visitors: Explore Central Park on two wheels. Stations: Central Park So. & 6th Ave.; also Broadway & W. 57th St. How much: $9.95 for a 24-hour pass; $25 for a 7-day pass. A one-hour rental costs about $14. Minimum age: 16. How it works: The first 30 minutes are included in the pass; $4 for the second 30 minutes; $9 for the third 30 minutes; $12 for every half hour thereafter. Recommended for visitors: Cruise around Boston Common. Station: Tremont St. & West St. How much: $6 for a 24-hour pass; $12 for a 3-day pass. A one-hour rental costs about $8. Minimum age: 16. How it works: The first 30 minutes are included in the pass; $2 for the second 30 minutes; $4 for the third 30 minutes; $8 for every half hour thereafter. -- Suzanne Rowan Kelleher contributed this to MiniTime.com.